There are signs of a growing acceptance in London that a referendum on unity in the Six Counties will be required in the circumstances of Britain’s departure from the EU. The future status of the North of Ireland is uncertain as Britain gets ready to leave the EU without a deal next month. The BBC has reported that several senior Tory cabinet ministers now believe that a hard Brexit would lead to a vote on Irish unification within the Six County area. The prospect of such a a ‘border poll’ is set out in the 1998 Good Friday Agreement, but it requires explicit approval from the British government before it can take place. One senior Tory minister told the BBC this week the prospect is now “very real” and “very much on the mind” of British Prime Minister Theresa May. Two other cabinet ministers “warned” the government of the “dangers” of “sleepwalking into a border poll”. They believed that people who are not from a nationalist background could “react badly” to a no-deal Brexit, especially if it leads to “serious issues” at the border through Ireland. They said that said there was an understanding in May’s government that a vote on unification would be a realistic means of coping with the “disruption and uncertainty” due to Brexit. The comments follow a prominent article in The Spectator magazine which asked if a referendum on Irish unity might be the best way to solve the Brexit border issue. The London-based publication is traditionally associated with influencing right-wing British opinion. The piece by David G Green, director of right-wing think tank Civitas, noted that 56 per cent of the north’s electorate backed remaining in the EU. Mr Green speculates that a similar proportion of voters might vote for Irish unity if given the opportunity. Sinn Féin president Mary Lou McDonald has said that it would be “grossly reckless and irresponsible” of the British government to allow Brexit to compromise the Irish peace process. 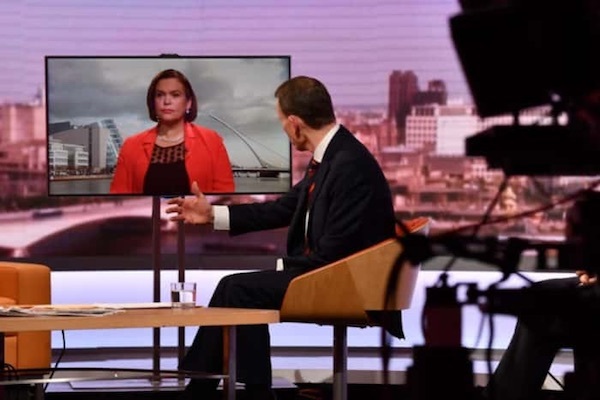 Speaking on The Andrew Marr Show, Ms McDonald insisted that the backstop -- a previously agreed mechanism to prevent the remilitarisation of the border area -- was the “bottom line” and that Ireland must protect its national interest. She said: “As the Brexit drama comes to a climax, we have to accept there is a possibility, if not a probability, of a hard Brexit crash and in those circumstances, we believe that the disruption and damage to the island of Ireland would be such that, don’t imagine that we will philosophically take it on the chin. “Put simply, if the border in Ireland cannot be mitigated, cannot be managed in the short term, well then you put the question democratically in the hands of the people and allow them to remove the border. “The backstop is the bottom line. “On the issue of the border poll, there’s no point us burying our heads in the sand and wish away a hard Brexit. Ms McDonald reiterated her challenge to the Dublin government to convene an Irish unity forum and said unionists have to start planning for “all eventualities”. Ms McDonald has said that the growing likelihood of a no-deal Brexit has pushed the idea of Irish reunification to the forefront of politics, but she believes mindset is the biggest stumbling block. She added: “The Good Friday Agreement provides a route to remove the border once and for all. Regardless of Brexit, there will be a unity referendum. “In our time we now have an opportunity denied to generations - a peaceful and democratic route to Irish unity; to build a new and united Ireland. “There are those who believe Irish unity is a pipe dream. “Some old wives’ tale about the four green fields, some don’t yet appreciate the huge opportunity that Irish unity can present for all of us socially and economically, and those that are hostile to the idea.